For the Parents of Children of Economically Weaker Section (EWS) as well as Disadvantaged Group (DG) finally a good news has been released by Directorate of Education of Delhi. The DoE has finally scheduled the dates for admission of above listed category students for the enrollment year 2018-19. 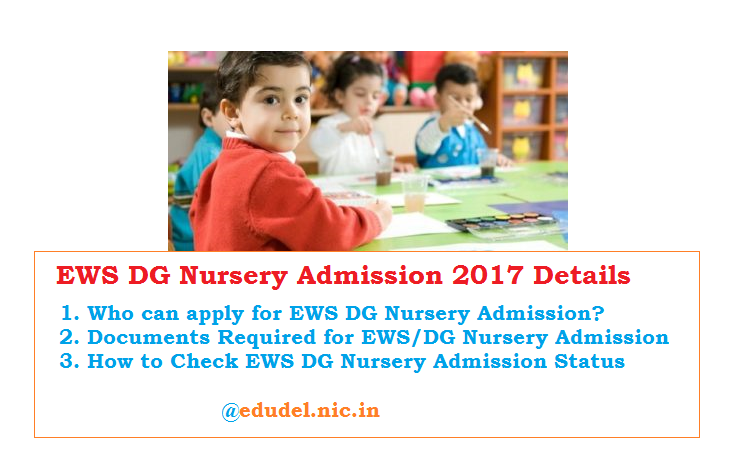 2 Who can apply for EWS DG Nursery Admission 2018? 2.1 Documents Required for EWS/DG Nursery Admission. The application process already started in the beginning of the year from January 10, 2018. While the last date for filling the admission, form was February 14, 2018. Now, when the parents are eagerly waiting for the results to be announced. The dates are scheduled by the Directorate of Education into two parts, i.e. March 7, 2018 and March 17, 2018. Students in both the parts are selected via Computerized Lucky Draw. For checking out in which list did your kid made to or whether your kid made to the list or not, you have to visit the official website of edudel.nic.in. After entering your kid’s registration number and Date of Birth click on the Submit button. Following this procedure, you can check out your kid’s admission status. You don’t need to be disappoint if your kid’s name isn’t in the first list. If your kid is fortunate, his name might appear in the second list whose scheduled date is March 17, 2018. If still your ward isn’t selected, you have to enroll him into general category where you have to pay both admission as well as monthly fees. Who can apply for EWS DG Nursery Admission 2018? Kids of families earning less than 1 lack per year are considered as Economically Weaker Section (EWS). And the Disadvantaged Groups include the Scheduled Category, Scheduled Tribe, Other Backward Class, Non-Creamy Layer, Physically Challenged, Orphans and Transgenders categories. According to the rules of Government of Delhi 25% seats across 1671 Schools and 13 Districts of the Delhi National Capital Region (NCR) are reserved to be filled through this kind of admission procedure. Documents Required for EWS/DG Nursery Admission. Following are the list of necessary documents in order to avail the benefit of admission under EWS / DG Nursery Admission. Parents of kids who are applying and seeking admission in Nursery must have Delhi’s Residence Proof. NOTE: For getting the benefits of EWS category, Income Certificate must be issued from Competent Authority of Delhi. Although, if you are a BPL or AAY Card holder, you can also apply for the admission in this scheme. So, all the very best to all the parents for bright future of their ward!